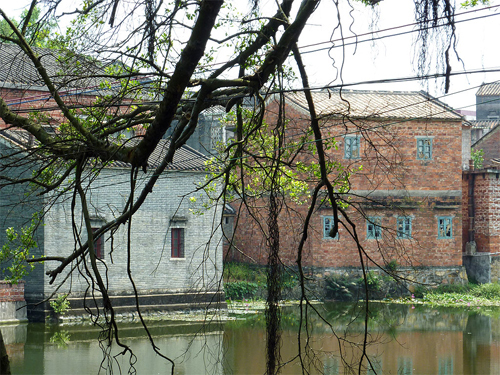 One of Guangdong’s hidden gems is found only 200 meters from some of the drabbest scenery you are ever likely to see in China. 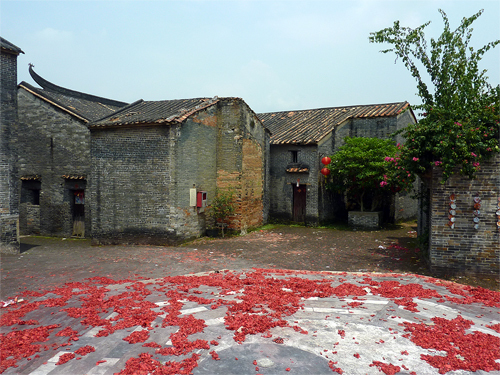 The road between the attractive town of Zhaoqing and the fascinating Bagua village of Licha Cun 黎槎村 has got to be one of the ugliest in China. 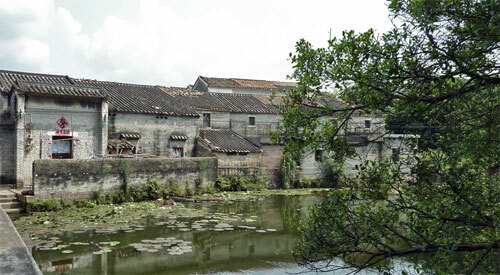 Dusty, dirty and lined, almost uninterruptedly, with small ceramic factories, many of them specialize in manufacturing toilet bowls of all shapes and sizes. These thrones, destined for backsides of China’s growing urbanized middle class, are haphazardly displayed along the side of the road making the traveler wonder if the world is just one big toilet. Yet, the ugliness is deceptive. Turn 200 meters down any small road leading off the highway and you enter a rural world of bucolic charm that has hardly changed for centuries. 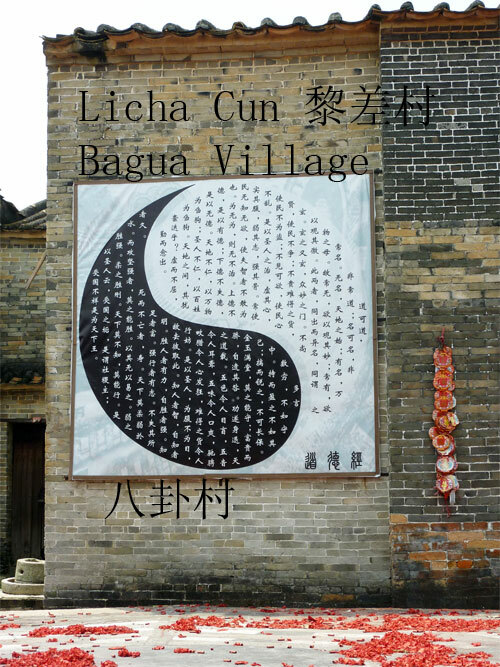 The turn off to the Bagua Village of Licha Cun is just one such example. 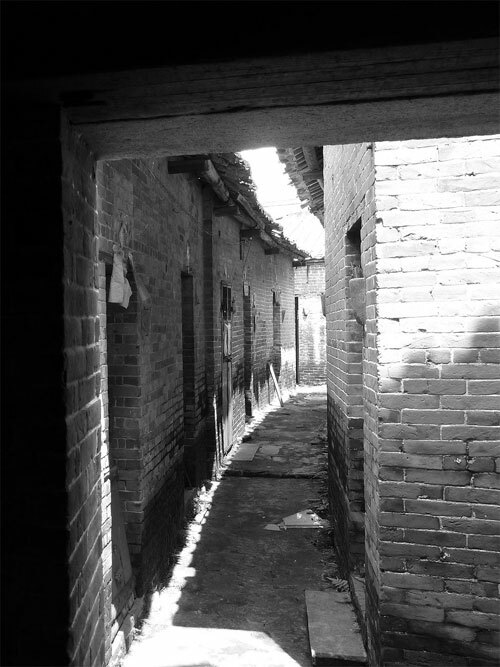 With a history tracing back more than 700 years, the Village of Licha Cun has been built exactly according to the octagonal symbol of Bagua, a design that converts the village into a labyrinth of narrow alleys and makes orientation near impossible. It’s an incredible place. 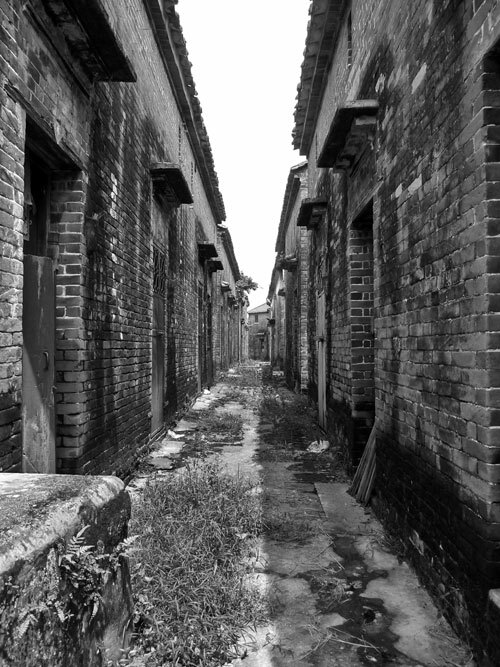 Many of the older houses in the centre of the village have been abandoned; in some case entire streets are empty. When you peep through the doors and windows you can still see the old furniture and other belongings left behind by the previous residents. Huge plants have reclaimed the streets making parts of the village look like a scene from an Indiana Jones movie. 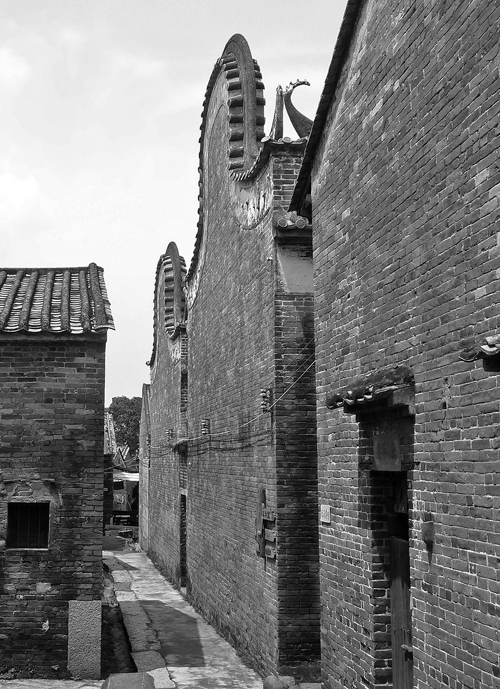 With so many empty dwellings a slight melancholy feel hangs over Licha Cun. 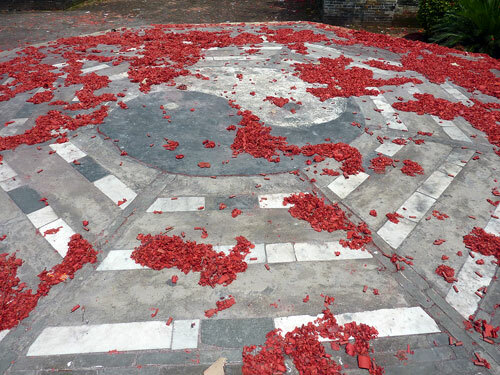 The center of the village has a square, in the middle of which is a huge stone platform, on top of the platform is a Yin and Yang symbol which when we visited was covered with the deep red debris of exploded firecrackers. The difference between the burgundy red and the old grey stone made a striking contrast. 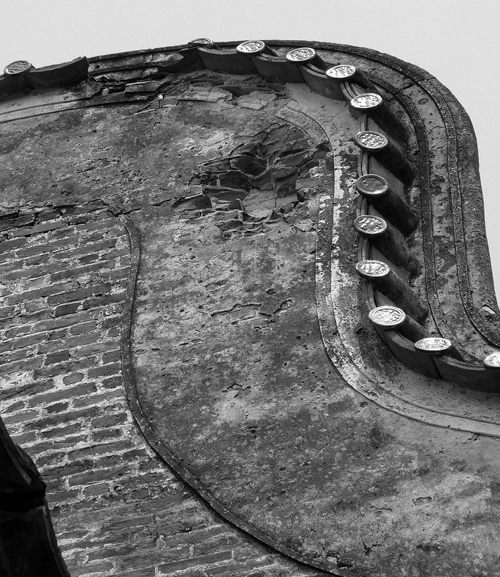 Another highlight in Licha Cun are the wok handle roofs. 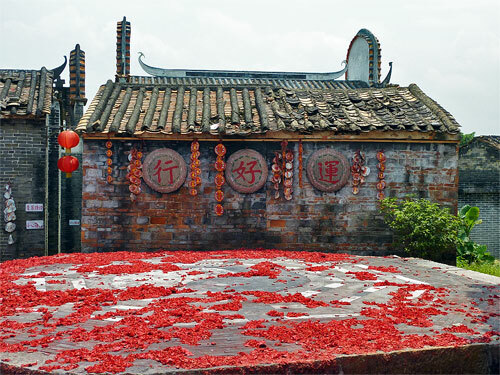 This style, distinctive to Guangdong Province, is supposed to bring luck and wealth to the families who live under them. There are plenty of examples in Licha Cun and some are gorgeously decorated. 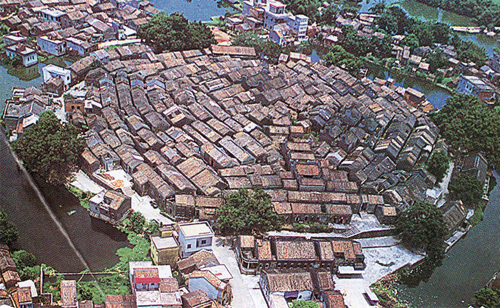 The roofs look as if you could pick up the houses with your hands as if holding a wok. 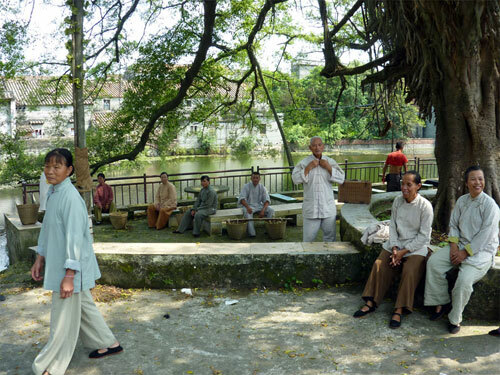 Some locals continue to inhabit the old village; you’ll find them sitting under the shade of the huge tree by the river. 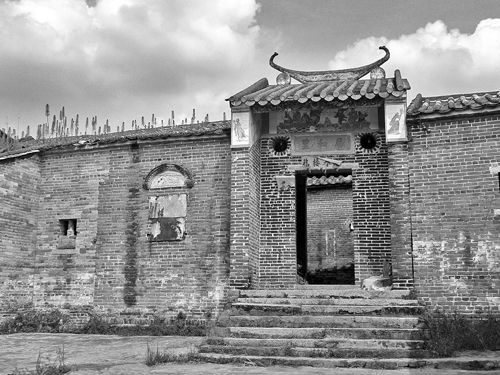 Fortune appears to have favored the the residents of Licha Cun, and they maybe on the verge of finding fame and fortune as part-time actors and extras in Hong Kong period soap operas. 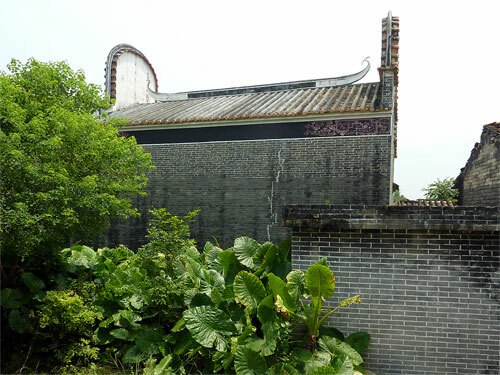 With its vernacular architecture perfectly intact, Licha Cun has become a popular place for Hong Kong directors to film scenes which need an old China backdrop. The day we visited there was a film crew finishing a major series and many of the locals were proudly dressed in early 19th century Chinese costumes. Apart from the little hubbub caused by the film crew we saw a few other Chinese tourists, Licha Cun is blissfully off the tourist trail. We spent about two and a half hours wandering around and chilling out under the tree by the river. 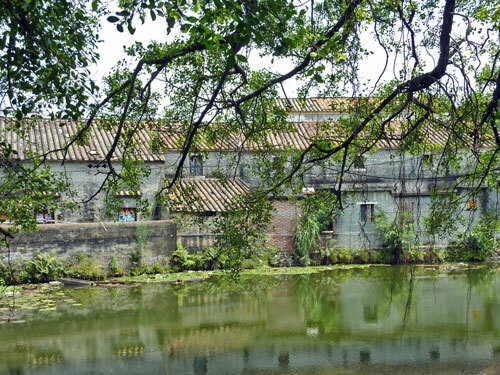 If you are in Zhaoqing (see later articles) then a visit to Licha Cun is a must. Take bus 315 from Zhaoqing’s Qiaoxi bus station ( they leave every 10/15 minutes). You’ll need to remind the driver to drop you off at the turn off. When you get off the bus don’t be put off by the toilet bowls. 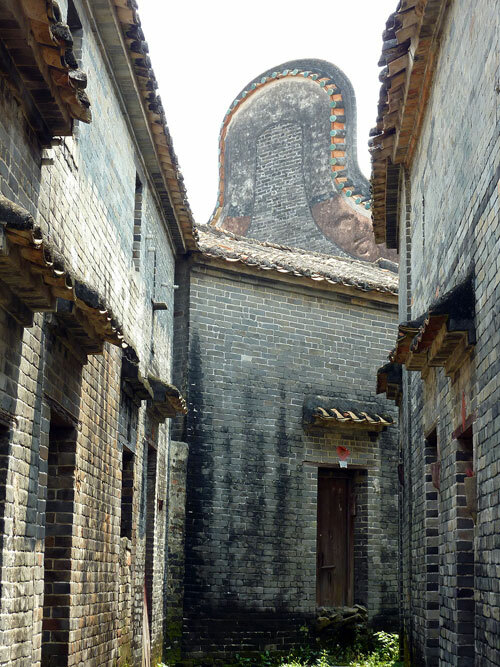 Just head down the road, there is a signpost of sorts and after about 200 meters you’ll come to the entrance of Licha Cun where there is a 20 Yuan entrance ticket. Returning, just go back to the main road and flag down any passing bus; they all go to Zhaoqing. There are no restaurants or souvenir stalls in Licha Cun. However, you can pick up an ice-cold beer from the shop by the ticket office and drink it under the huge tree by the river. It’s a heavenly experience. We stayed in the Hubin Hotel 湖滨大酒店 in Zhaoqing it has a great location and reasonably priced decent rooms (around 220 yuan). Our room had lake views with a terrace. Oh my goodness, how charming.